In 2012, Voyager 1 — one of a pair of deep-space probes launched in 1977 — crossed into a part of space no other spacecraft had ever seen: the interstellar medium. At over 11 billion miles from the Sun, several crucial changes were detected in the data Voyager 1 was sending back to Earth – key observations to show that Voyager 1 was entering interstellar space. Now, recent data from the Voyager 2 spacecraft gives us the first indication it too is about to cross over the heliopause — the final boundary of the heliosphere — to interstellar space. Scientists are looking to what happened in Voyager 1 observations to estimate where Voyager 2 is in its own journey. As Voyager 1 neared that border, it began to see more particles that originated outside the heliosphere and fewer that originated from inside it. It also observed that the magnetic field that Voyager 1 was experiencing changed in magnitude, increasing beyond what was typical within the rest of the heliosphere. Naturally, scientists are watching for similar clues in Voyager 2 data. In September 2018, the spacecraft’s Cosmic Ray Subsystem, or CRS, began to measure an increase in galactic cosmic ray particles that are hitting, interacting or passing through Voyager 2. Our heliospheric particles can be differentiated from galactic cosmic rays by their energy levels: while heliospheric particles have energy signatures above .5 MeV, galactic cosmic rays have much higher energies — over 70 MeV. 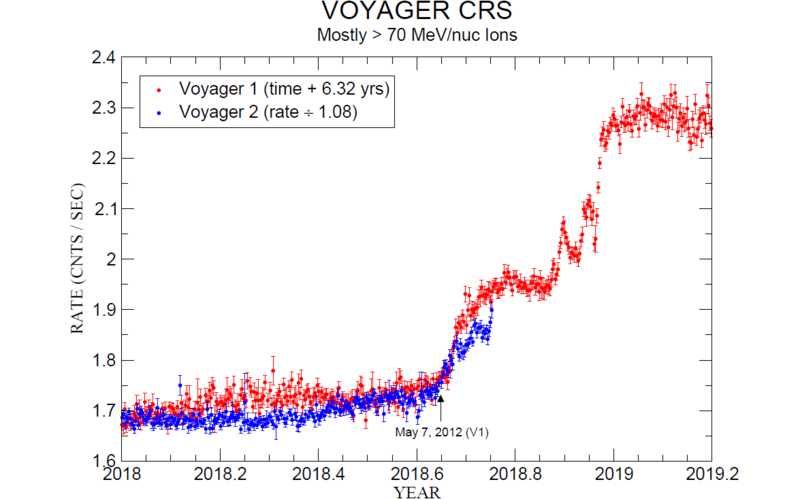 The increase that the Voyager 2 CRS has seen in 2018 is similar to the jump that Voyager 1 first saw back in May of 2012. The following graph shows the data from Voyager 1 around the time it crossed over the heliopause. The vertical scale of the graph is the count rate of the galactic ray particles, or how many particles per second are interacting with the CRS on average for each day. The horizontal scale of the graph is the time, from Jan. 1, 2018 to March 14, 2019. (Note: the time has been shifted forward 6.32 years, to line up with the Voyager 2 data in the next graph). Reading from left to right, showing Voyager 1 CRS data over time, the observations show more and more of the high energy particles from the interstellar medium – indicating that the farthest reaches of the solar wind is increasingly unable to halt the progress of the incoming galactic cosmic rays. Note how similar the two data sets are. This is our first hint that Voyager 2 is crossing through a region similar to the one that Voyager 1 did – it’s nearing the heliopause. Perhaps the data will continue to match up perfectly – and we can expect Voyager 2 to cross out of the heliosphere by January 2019, three months after first spotting elevated galactic cosmic rays, just as Voyager 1 did. There are several differences between Voyager 1 and Voyager 2 that make the exact date of the crossing difficult to predict. 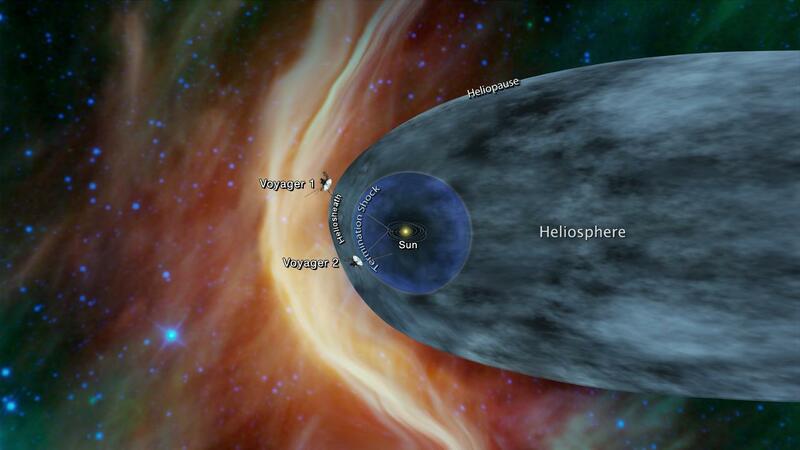 For one, Voyager 2 is travelling at a different angle than Voyager 1. Voyager 1 is travelling at a northern angle to the solar equator, while Voyager 2 is travelling at a southern angle. This is because of a change at Saturn, where Voyager 1 took a detour to take a closer look at Titan while Voyager 2 continued its original path. As the exact shape of the heliosphere at the boundary is not well known, these different trajectories mean that it is difficult to determine where exactly Voyager 2 will cross into the interstellar medium. Voyager 1 also travels at 38,027 mph, while Voyager 2 goes at a reduced pace of 34,391 mph. That 3,636 mph, a 10% difference, means that Voyager 2 may take longer to cross the heliopause than Voyager 1. Finally, there’s also the difference in the solar cycle – when Voyager 1 crossed the heliopause, the solar cycle was approaching a maximum, the phase of its cycle when it’s most active and expelling the most material. But as Voyager 2 nears the heliopause, the Sun is approaching solar minimum. This means the heliosphere itself may change shape and size, which also makes it more difficult to predict exactly where or when the heliopause will be crossed. It could take longer to cross over the heliopause, or it could happen much faster due to all these factors. 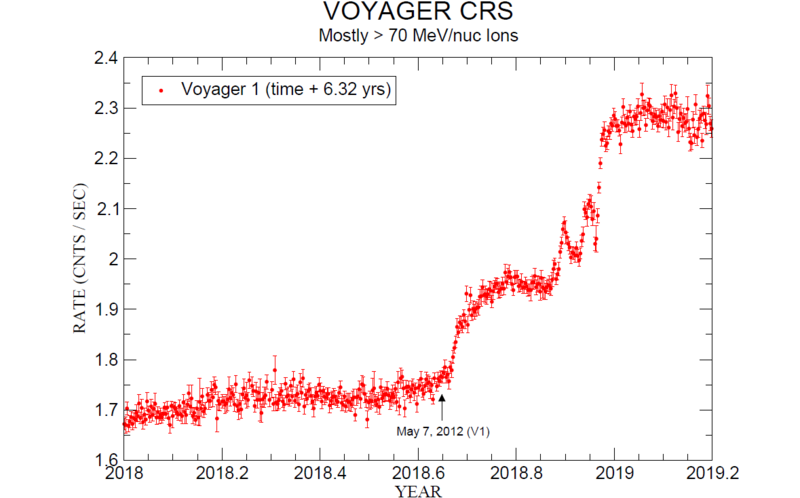 Once Voyager 2 crosses from the heliosheath into the interstellar medium, the galactic cosmic rays will level out, or plateau, much like they did with Voyager 1. Then the heliospheric particles will lessen and die down, and the magnetic field might increase in magnitude. These are the trends Voyager 1 saw, and we can expect to see them again. Scientists will also be watching for a whole new set of observations: Voyager 2 still has an instrument powered on that was not working on Voyager 1 when it crossed the heliopause. Voyager 2’s Plasma Science instrument can measure the density, temperature and speed of the solar wind plasma, which may give more information about the differences between the heliosphere and the interstellar medium. So, when will we get there? We’re not exactly sure — but that’s the exciting part. Learn more about the Voyager missions and keep an eye on The Sun Spot for more information as we follow Voyager 2 into the unknown. On Aug. 20, 2018, a Coronal Mass Ejection — an explosion of hot, electrically charged plasma erupting from the Sun — made its way towards Earth. By Aug. 26 it had hit — and aurora were visible as far south as Montana and Wisconsin in the United States. NOAA’s DSCOVR satellite (short for Deep Space Climate Observatory) watched it all go down. DSCOVR’s measurements track magnetic field strength and direction – two aspects of a CME that determine how much it will affect Earth. These data, and the unique view of a CME that they provide, are why DSCOVR is such a useful tool for NASA’s space weather forecasters, detecting CMEs between 15 minutes to an hour before they strike Earth. Here’s a plot showing what DSCOVR saw before the CME hit it, while it was passing over, and after it passed. The north-south magnetic field strength on its own. (The units are in nano-Tesla — named after Nikola Tesla, the famous physicist, engineer and inventor). Let’s walk through what happened. Before CME hits Before the CME hits, DSCOVR is surrounded by the solar wind. Compared to a CME, the solar wind’s magnetic fields tend to be a little more chaotic — note the squiggly lines to the center-left of the graph. (Further to the left you can see traces of a weak CME that passed by DISCOVR on Aug 24). Some CMEs leave the Sun so fast that they create a shock: a pile-up of solar wind plasma at their front end that creates jagged lines in DSCOVR data, like a Richter scale during an earthquake. 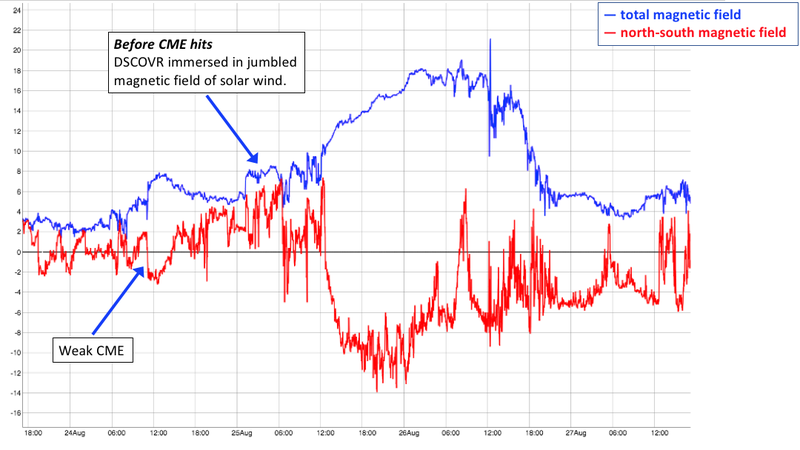 This CME was moving comparatively slowly, so no real shock is apparent. 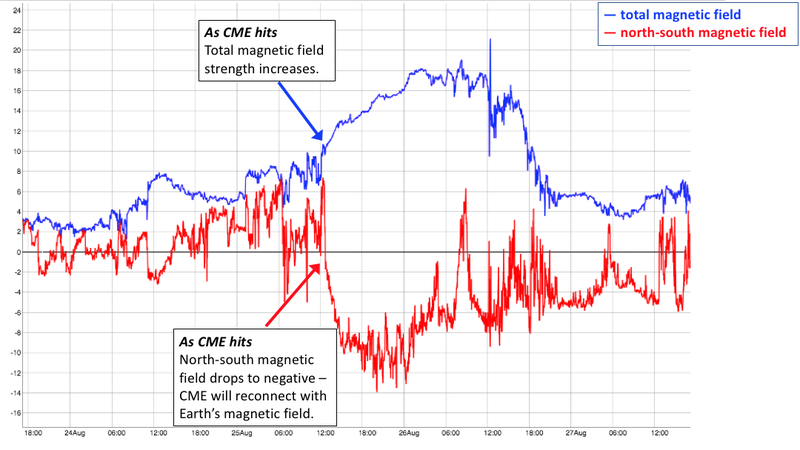 The CME hits As the CME hits, DSCOVR’s total magnetic field readings (blue) get stronger. The north-south component (red) starts to plunge below zero — not all CME’s have a strong negative north-south component like this one did. When the red line is above zero, that means that the magnetic field hitting DSCOVR is heading primarily in the northward direction, the same as Earth. No problem there — the incoming magnetic energy simply slides right along with Earth’s own fields. But if the red line goes below zero — the magnetic field direction heads south — then the incoming magnetic field is oppositely aligned to Earth’s. And you probably remember from childhood that opposite magnetic poles attract. If a CME has a strong southward magnetic field it can create havoc with Earth’s magnetic fields, peeling back the outward layers like taking the skin off of an orange. This allows particles to sneak past the magnetosphere’s boundary and rain down toward Earth. The beginning of a CME looks very similar to the regular solar wind, so in real-time, just as it starts, space weather forecasters check plots of plasma density and speed (not shown here) to help determine if they’re really seeing a CME. 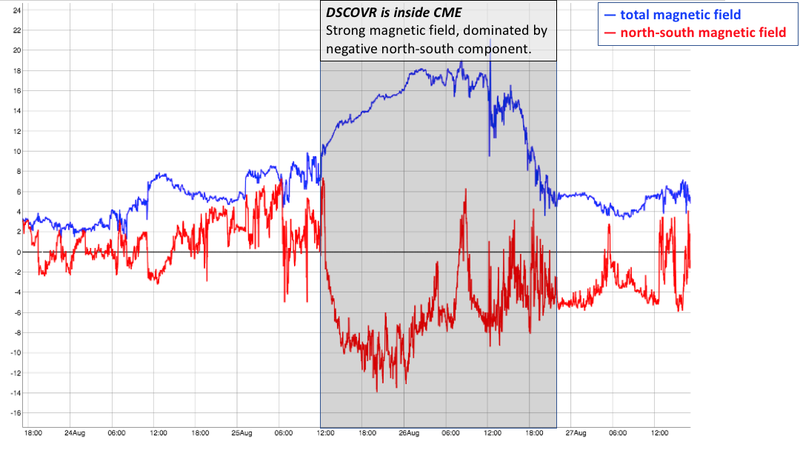 DSCOVR is inside the CME Once inside the CME, the magnetic fields become stronger and in this case the north-south component stays largely negative (remember, that means the magnetic field is directed south and the CME can more easily disturb Earth’s fields). A CME is like an intact chunk of the Sun that has exploded outwards, taking its structured magnetic fields with it; the solar wind is more like shrapnel. Towards the end (right side) of the CME, DSCOVR was hit with a high-speed stream of solar wind — you can see that the magnetic fields start looking a little messier. Once the CME has passed, it leaves gusty, turbulent plasma in its wake before petering out into the solar wind. 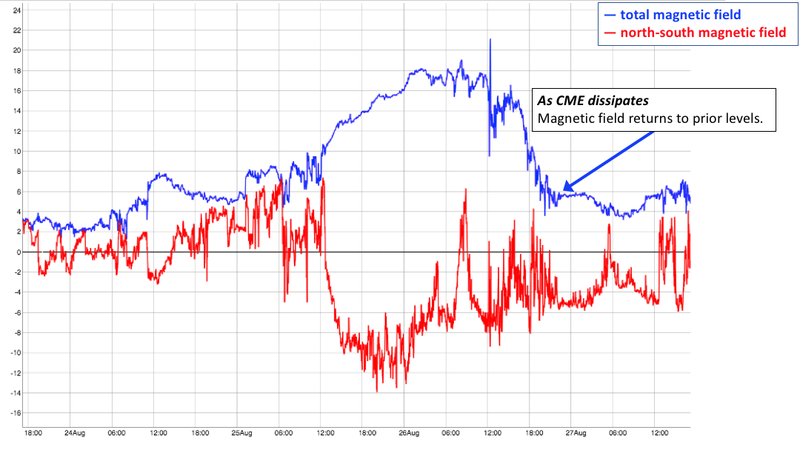 Magnetic field readings return to their normal levels. Depending on DSCOVR’s observations and further simulations, warnings may be sent out to agencies that operate satellites. The Aug. 20 CME (it hit Earth on the Aug. 25, but CMEs are labeled based on when they left the Sun) was not fast enough to warrant these alerts. However, its strong north-south component was strong enough to generate a geomagnetic storm: on the 0 – 9 Kp scale, which measures the disturbance in Earth’s magnetic fields, this one clocked in at a 7. News outlets and blogs reported on it, and aurora sightings right after the event were documented on Aurorasaurus — NASA’s aurora-detecting citizen science collaboration, where real-time aurora sightings are scraped from the web via Twitter or reported directly on their website. 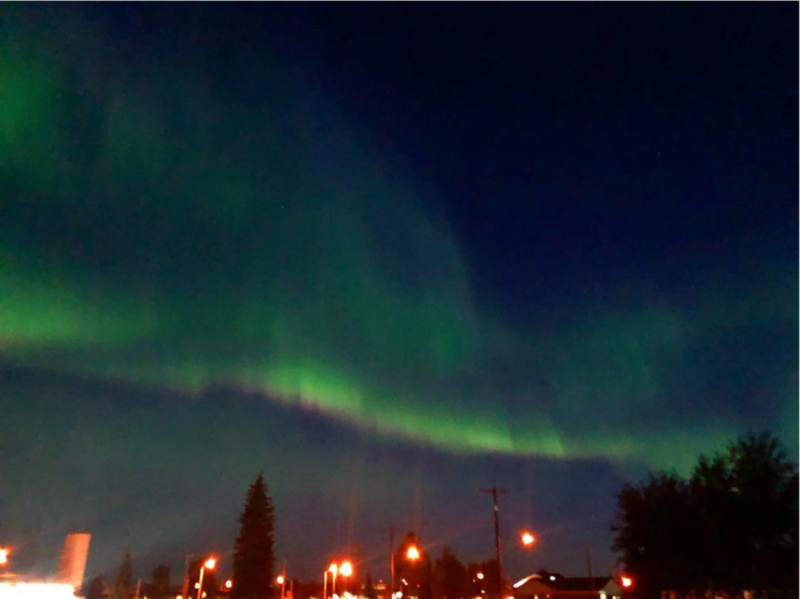 Here’s a photo from one user in Fairbanks, Alaska, posted just after midnight on August 26. September 22, 2018 marked the 12th launch anniversary of Hinode — a solar observatory collaboration between the Japan Aerospace Exploration Agency, the National Astronomical Observatory of Japan, the European Space Agency, the United Kingdom Space Agency and NASA. Twelve years is long enough for Hinode to observe most of a complete solar cycle. 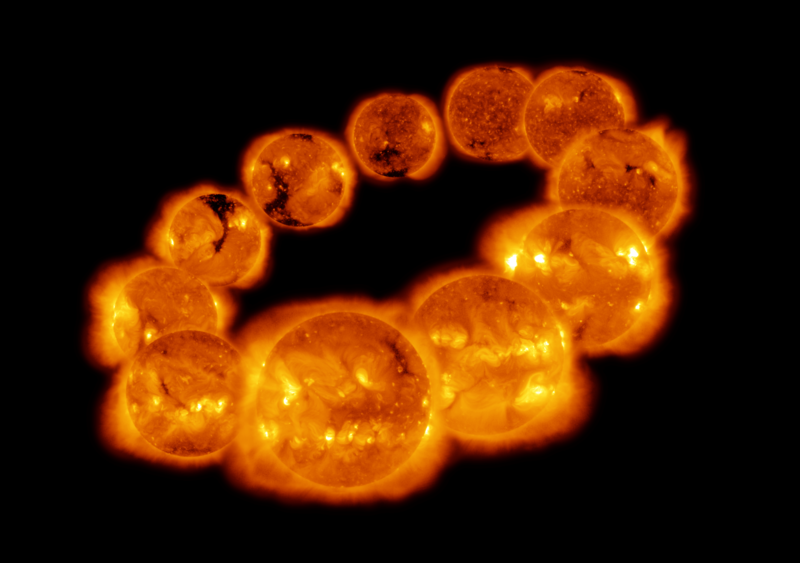 The above image represents Solar Cycle 24 as observed with Hinode’s X-Ray Telescope, or XRT. The XRT observes the Sun’s hot corona, or solar atmosphere, in soft X-rays — wavelengths of light that reveal solar activity reaching tens of millions of degrees Fahrenheit. The solar cycle refers to an 11-year-long period (on average) during which the Sun’s magnetic field flips — north becomes south, and vice versa — and magnetic activity increases and then decreases. Although driven by the Sun’s internal magnetic dynamo, the progression of the solar cycle is marked by activity visible on its surface and in the corona, including bright solar flares and dark sunspots. The corona, as documented by Hinode’s XRT, reveals an extensive amount about the Sun’s variable activity. In the graphic above, the farthest (smallest) image is from 2007 and each image increments clockwise by one year. The nearest (largest) image is from 2013, around solar maximum. Note the enhanced presence of bright active regions in the closer images, as the Sun approaches solar maximum. Solar Cycle 24 began on January 4, 2008 with the emergence of a bright active region in the north, and is expected to reach its minimum sometime in 2019. Hinode’s XRT has taken full-disk synoptic images twice daily for the whole mission (aside from its monthly 3-day maintenance periods). This long baseline set of measurements extends the cycle of observations from Hinode’s predecessor, Yohkoh, which ended in 2001. Hinode maintains a polar orbit around Earth from approximately 370 miles altitude, carrying three scientific instruments: the Solar Optical Telescope, the X-ray Telescope, and the Extreme Ultraviolet Imaging Spectrometer. On Sept. 11, 2018, at approximately 6 a.m. local time in eastern South America, NASA’s Global-scale Observations of the Limb and Disk, or GOLD, mission sent back its very first image. Maps like this one enable researchers to determine global-scale temperature and composition at the dynamic region where Earth’s upper atmosphere meets space. The image shows ultraviolet light (135.6 nm) — a kind of light that’s invisible to the human eye — emitted by atomic oxygen present approximately 99 miles (160 km) above Earth’s surface. The colors in the image correspond to emission brightness: The strongest emissions are shown in red and the weakest in blue. Known as “airglow,” this light is produced by oxygen as it transitions from an excited state to a lower energy state. Outlines of the continents and a latitude-longitude grid have been added for reference. 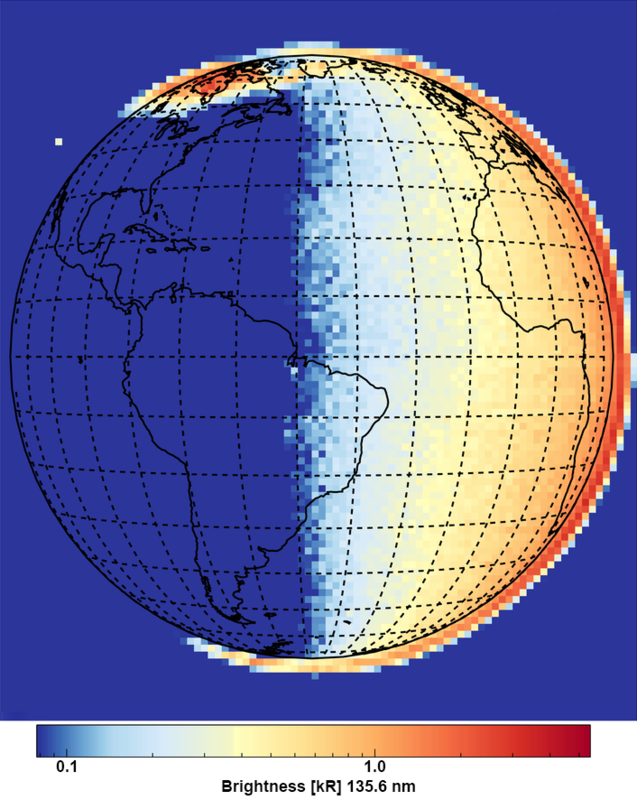 The right side of the image shows the Sun-facing side of Earth, revealing daytime airglow, but emissions at the North and South Poles extend to the left, into the night side. These are the aurora borealis (northern lights) and australis (southern lights). The northern lights are more clearly visible in this image because their location depends on Earth’s magnetic dipole field, which is tilted southward over North America at the top left of the image. At the southern horizon, the magnetic field is tilted slightly away from the Americas. The speck of light visible over the western horizon is an ultraviolet star, 66 Ophiuchi (HD 164284). GOLD launched from Kourou, French Guiana, on Jan. 25, 2018, onboard the SES-14 satellite and reached geostationary orbit in June 2018. Built by the University of Colorado Boulder’s Laboratory for Atmospheric and Space Physics, and managed by NASA’s Goddard Space Flight Center in Greenbelt, Maryland, GOLD will improve our understanding of the Sun’s impact on Earth’s upper atmosphere as well as the effects from terrestrial weather below. GOLD commissioning — the period during which the instrument’s performance is assessed — began on Sept. 4 and will run through early October, as the team continues to prepare the instrument for its planned two-year science mission.